Time: 8h30min (walking time without stops). Difficulty: Pay attention in slippery conditions around the stakes in Soaso. 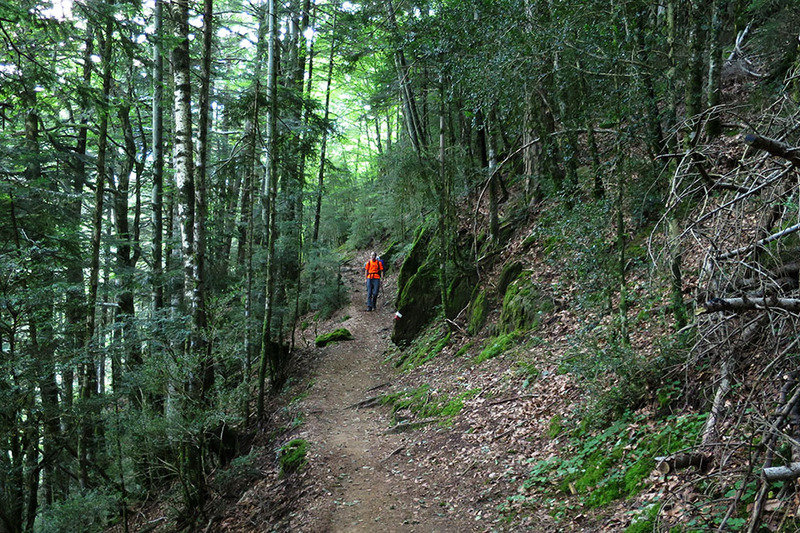 This can be avoided by taking a path to the right. Notes/suggestions: You do not pass any villages until Parzán. In case of necessity, you can take a detour to Torla (3kms by road) when you reach Puente de los Navarros. 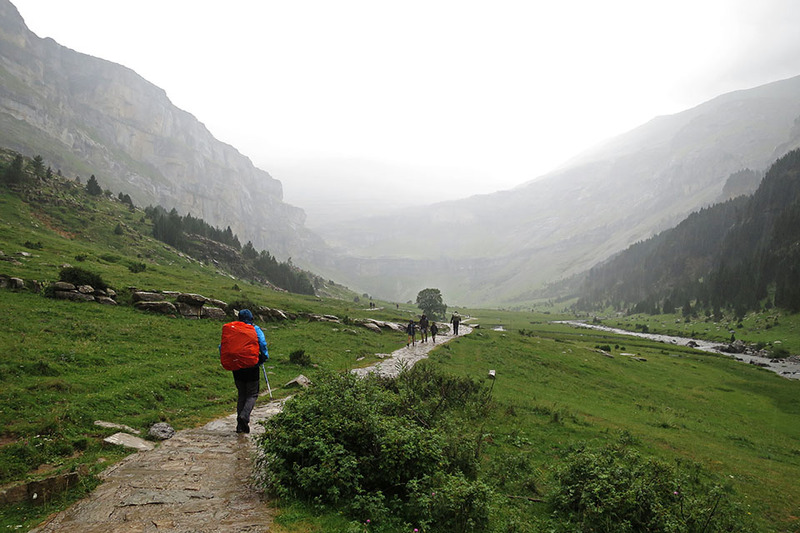 The Pyrenees Walk heads down Bujaruelo valley via the narrow Garganta de los Navarros gorge and enters the Ordesa y Monte Perdido National Park and climbs the Ordesa valley until it comes to Góriz mountain refuge. (0h00min; 0,0kms) Refugio de Bujaruelo (1.338m). The GR11 crosses over San Nicolas medieval bridge, then heads down the left-hand side of the valley, following the Senda de los Abetos trail. 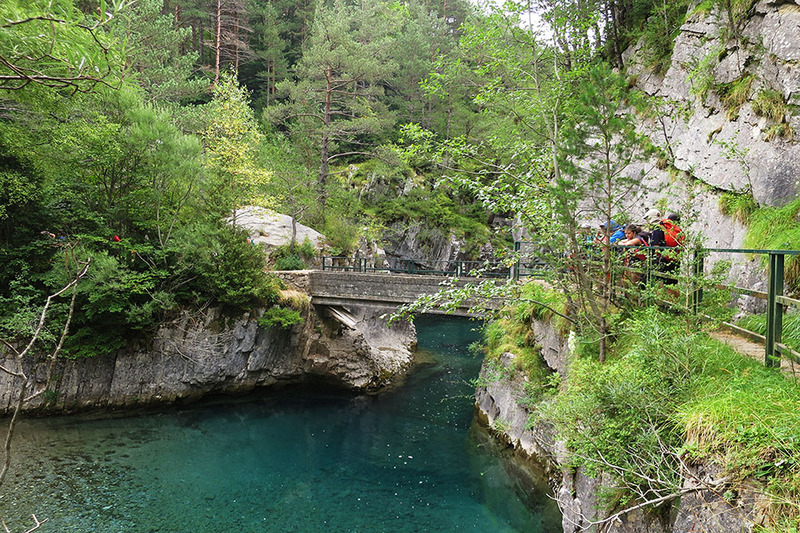 After about 3kms you reach Los Abetos bridge just opposite the Valle de Bujaruelo campsite. Do not cross the bridge and keep walking on the same side to Santa Elena bridge, where you will once again come to the vehicle-friendly track that goes up to the auberge. 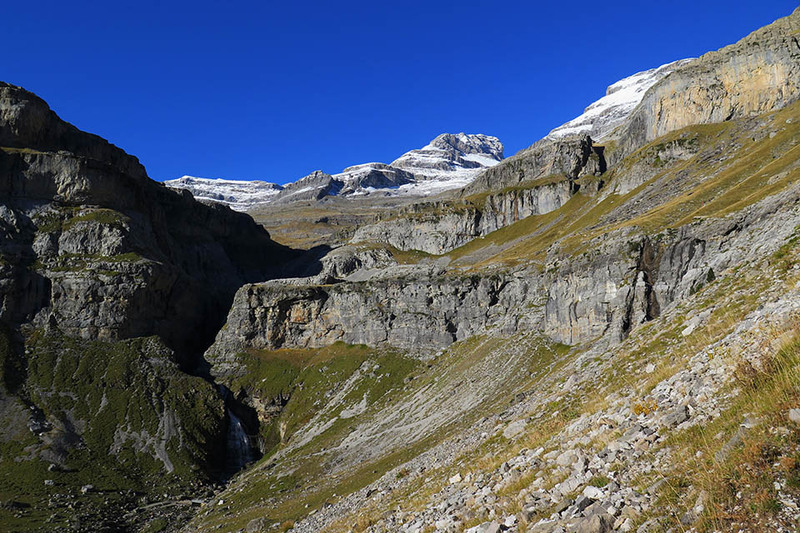 You cross the bridge, and follow the path that now heads along the right-hand side of the narrow Garganta de los Navarros gorge, until you reach the road that runs from Torla up to the Ordesa car park. 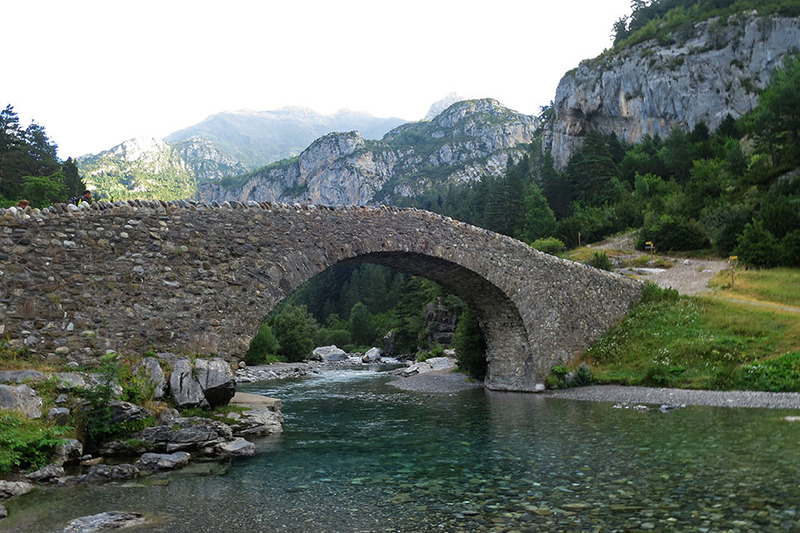 (2h30min; 7,3kms) Puente de los Navarros (1.075m), the western edge of the National Park. 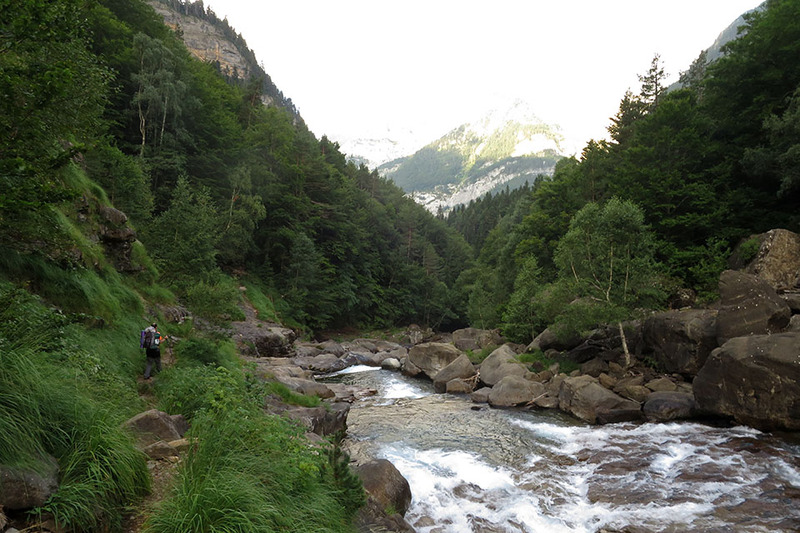 The GR11 leaves the road, and on the right, drops down to cross the River Arazas via the Puente de la Canaleta bridge. 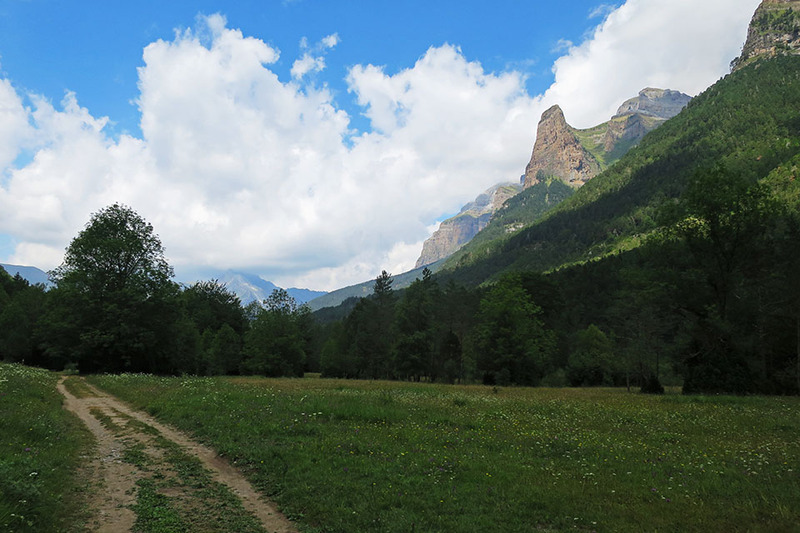 The path veers east and heads into Ordesa valley. 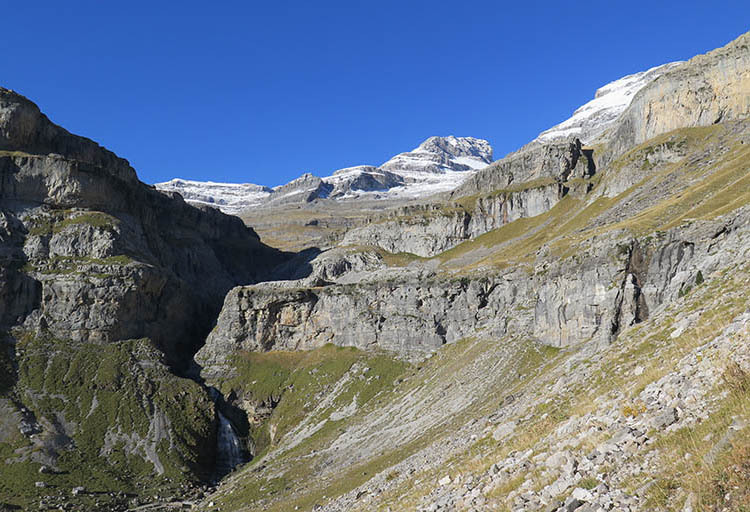 Gigantic mountain walls open out on both sides: to the left, the Mondarruego or the renowned Tozal de Mallo, and to the right, the Sierra de las Cutas. 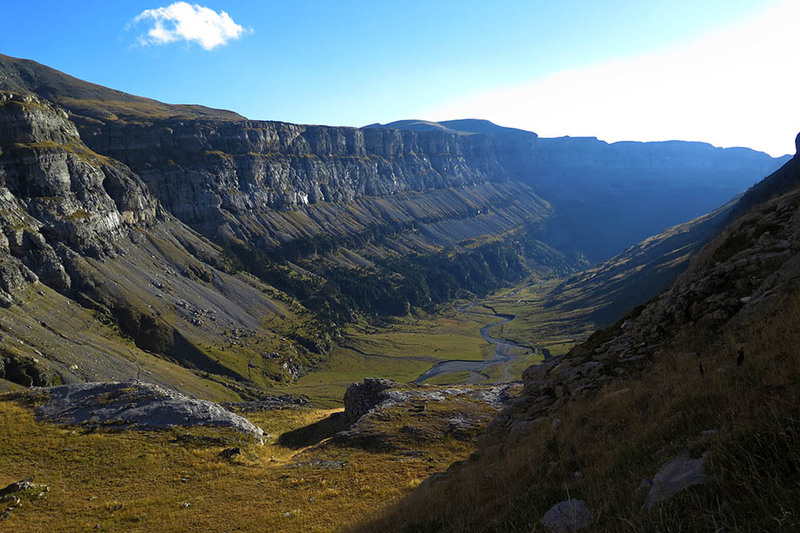 (4h20min; 12,6kms) Pradera de Ordesa (1.300m). 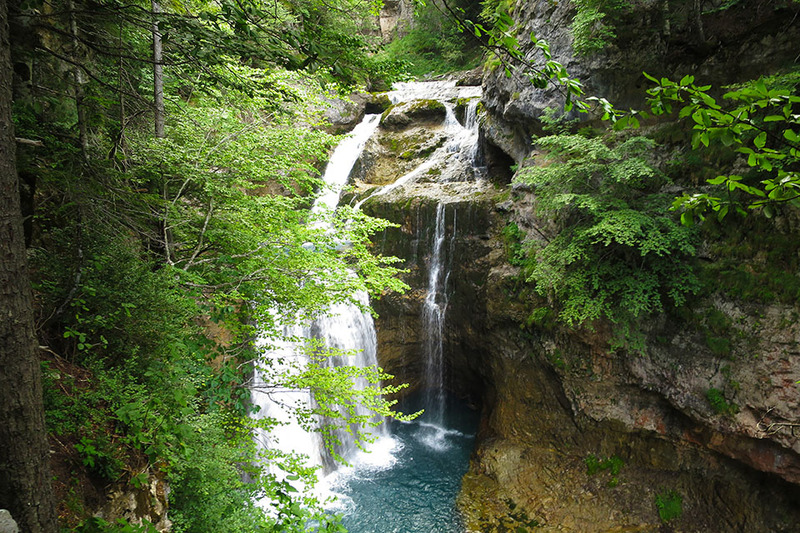 In summer, this overcrowded spot is the customary starting point for the vast majority of excursions. 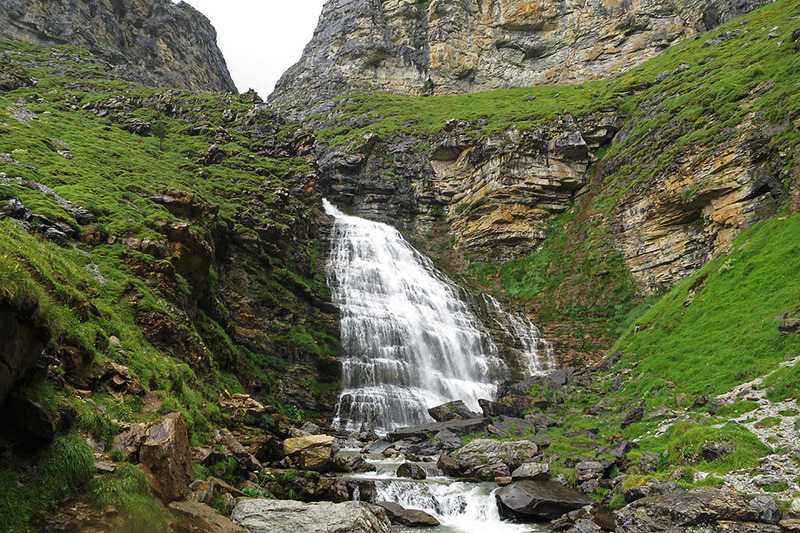 The path climbs up the whole valley towards the Soaso cascades and Soaso cirque. 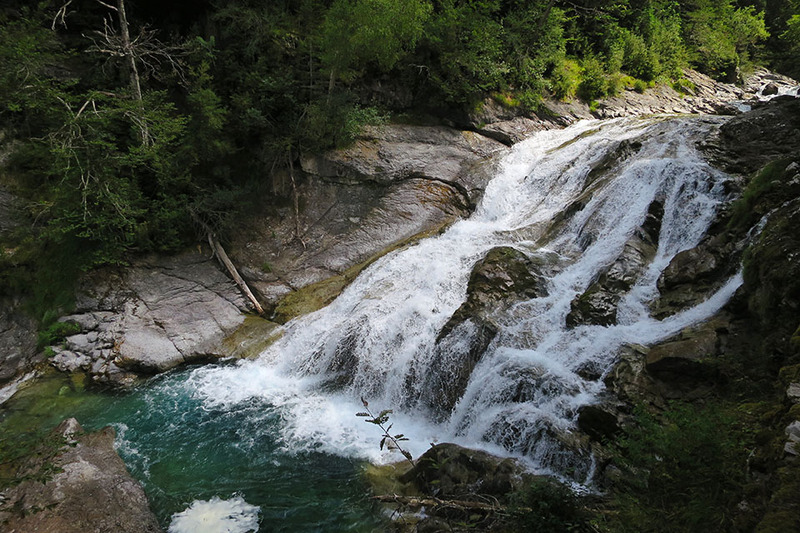 The Cola de Caballo waterfall can be seen to the left. 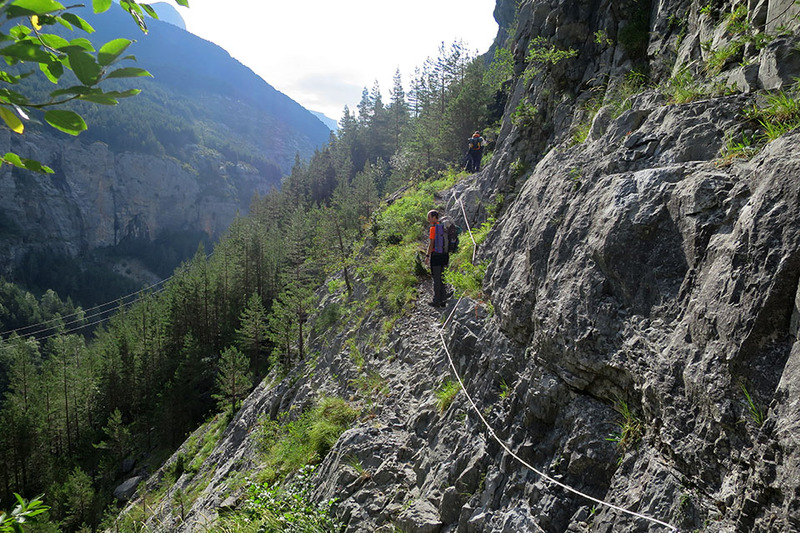 There are two options at this point: the classic ascent by means of stakes, or a zigzag route to the right. (8h30min; 24,6kms) Refugio de Góriz (2.200m). 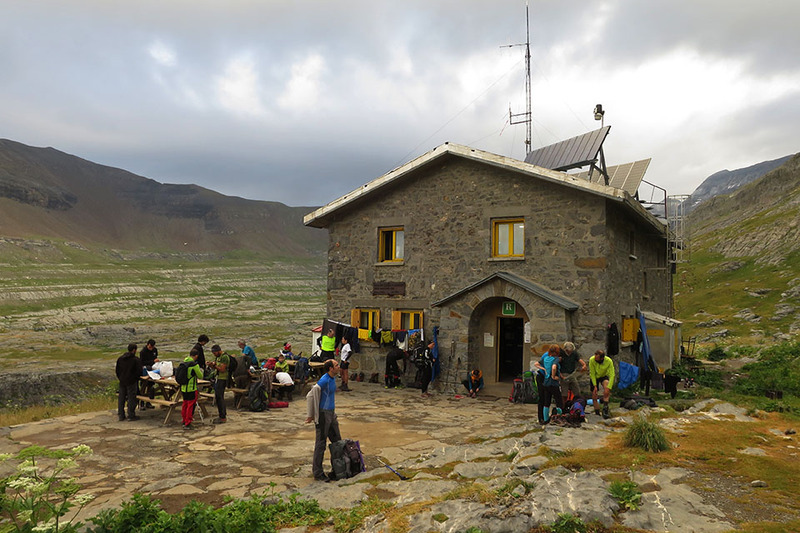 At the beginning of the stage, the Refugio de Bujaruelo	(//) , (64 beds in rooms for 2, 4 or 8) has a restaurant, a café, camping facilities and food all day long. Three kilometres down the road, following the track coming from Puente de los Navarros you will find the Camping Valle de Bujaruelo	(//) . 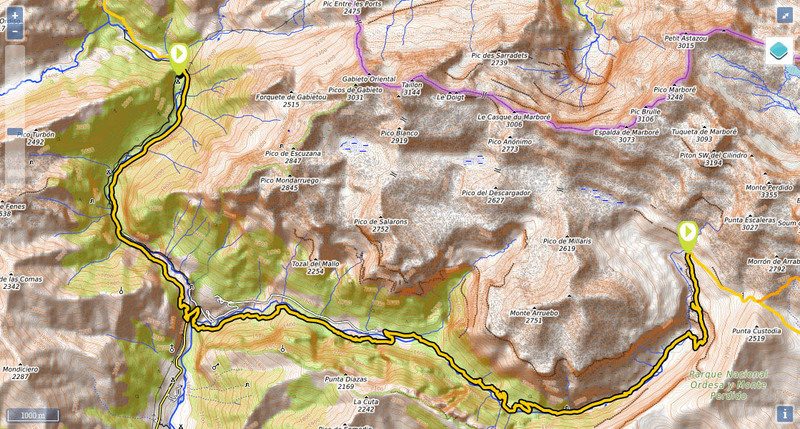 As well as an area for camping, it has chalets, a shelter, a bar-restaurant plus a small supermarket. During the stage there are a few free shelters like the one at La Faja de Pelay (on the hunters’ trail) or Soaso shelter. 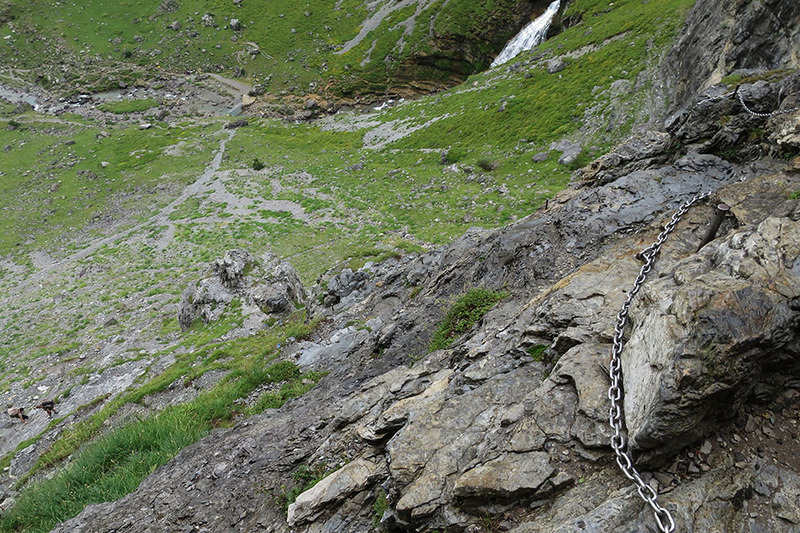 At the end of the stage you have the Refugio de Góriz () . In high season and most weekends of the year it tends to be fully booked, so be sure to book in advance, which is done exclusively online. Only late bookings can be made by telephone. 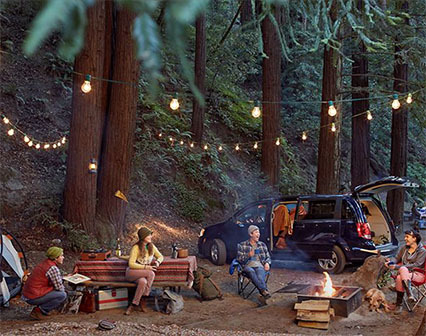 The other option is to camp outside the refuge, between dusk and dawn (following park regulations). The Valle de Bujaruelo campsite has its own supermarket (3km from San Nicolas de Bujaruelo following the track). 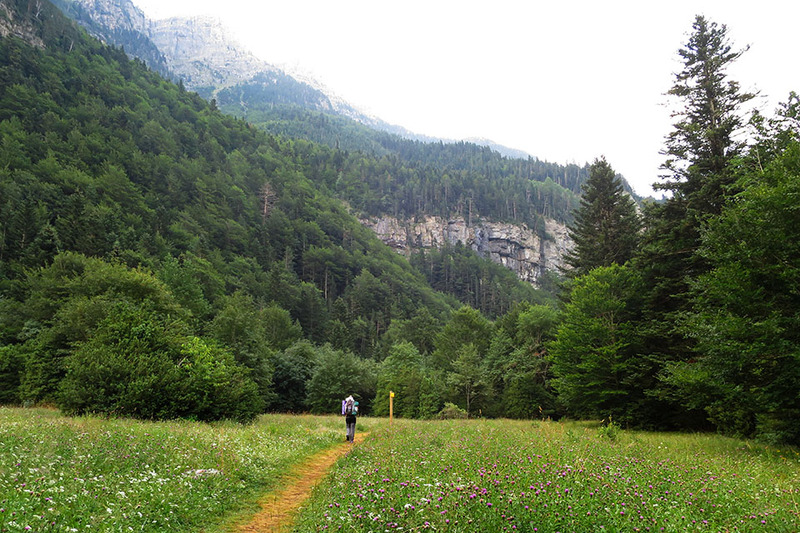 In Torla, after a 3km detour from the route, you can find practically anything. Bujaruelo is accessible by car via a track (6km from Puente de los Navarros). Another option is to hitch a ride with one of the cars heading to the auberge or the campsite. 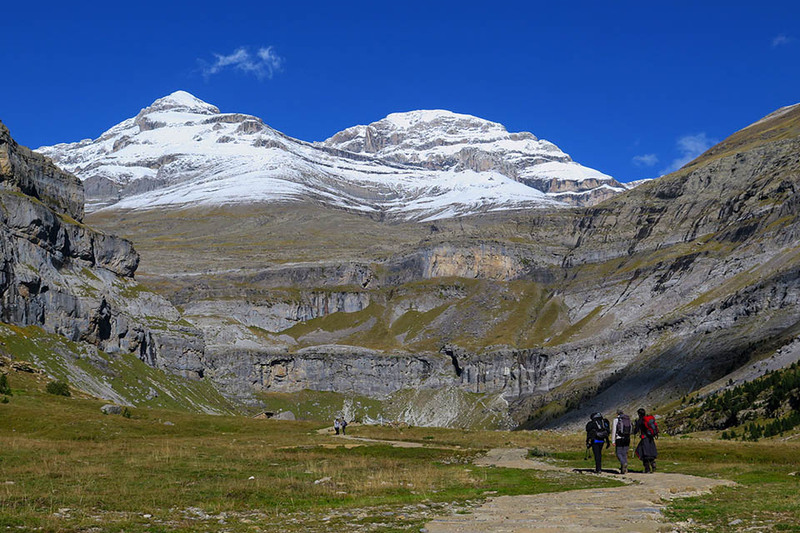 Góriz mountain refuge is only accessible on foot, the most common route being the GR11 coming from Pradera de Ordesa. 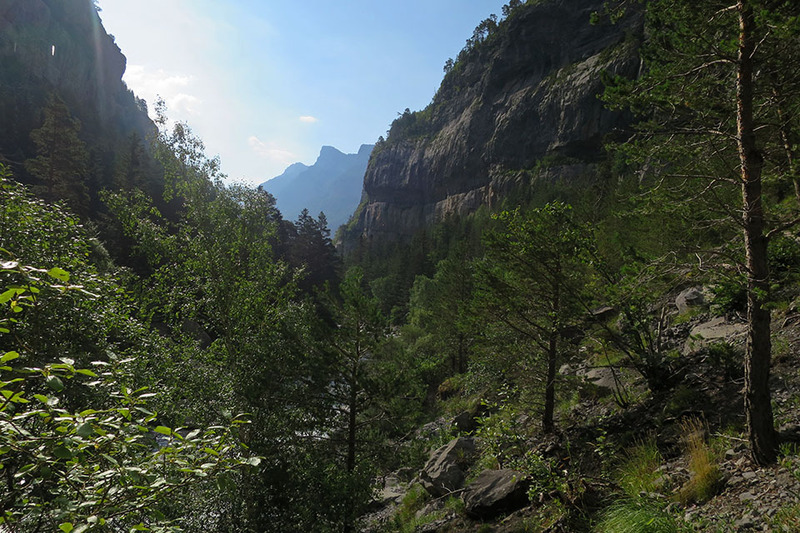 A tourist bus takes you from Nerín up to Sierra de las Cutas, which shortens your approach journey considerably. 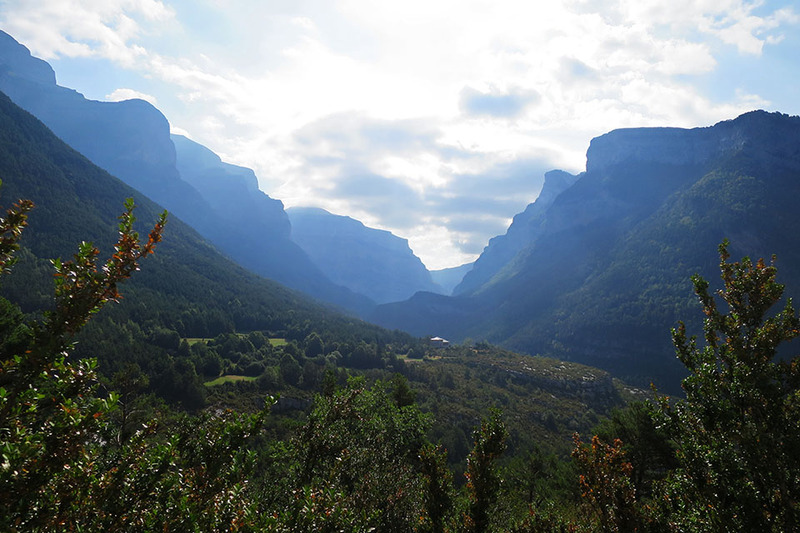 During the summer months and over Easter, the Park public transport bus service takes you from Torla to Puente de los Navarros and on up to Pradera de Ordesa (regular times there and back throughout the day). 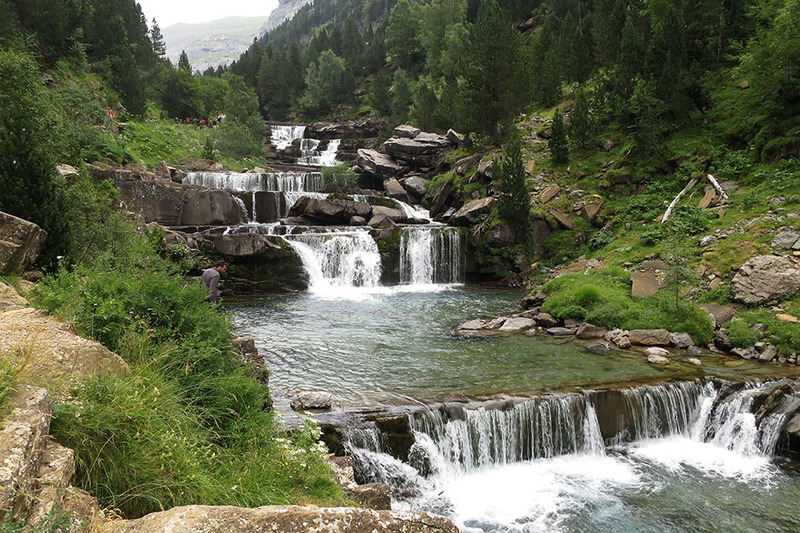 During these periods private vehicles are not allowed access to Ordesa valley (Pradera). There is a car park for private vehicles and buses in Torla. 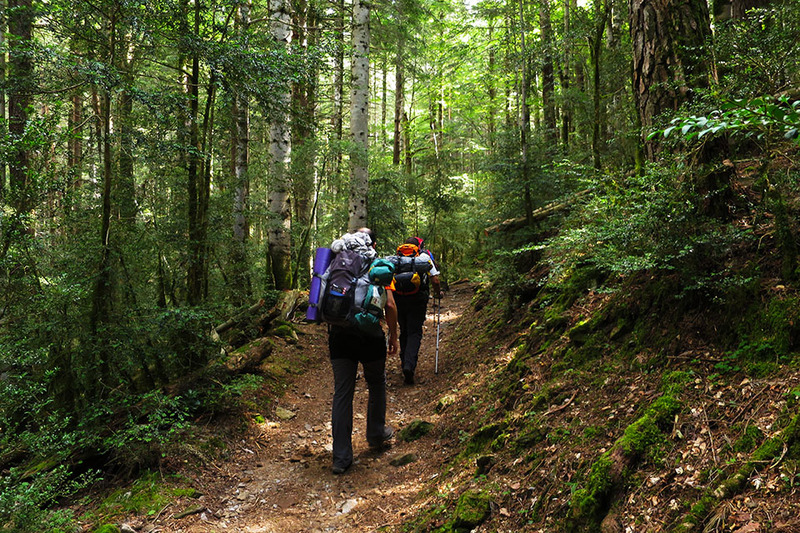 Another way to reach Puente de los Navarros from Torla is by walking the GR 15.2 route. To get to Torla, there are buses with connections from Sabiñanigo-Jaca, operated by the company Alosa.